JDeveloper is slow, or is it? I'm using Oracle JDeveloper 11g - Technical Preview (Studio Edition Version 11.1.1.0.0), and it was incredibly slow. Opening project, drawing database diagram, switching between application, etc are really testing my patient. I'm using a pretty good notebook: Win XP, dual core processors, 2 GB RAM, and plenty of HD space. After a few searches here and there, the cause turns out not due to hardware or Oracle, but the setting on my graphic card, ATI. 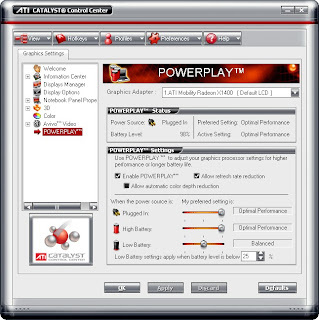 Right mouse click on the Windows desktop and select ATI Catalyst Control Center. Select View > Advanced View to show advance settings. In the POWERPLAY menu, make sure your preferred settings are set to Optimal Performance. See the screenshot on the right. Now my JDeveloper magically runs like a cheetah.... and my other Swing app as well (SQL Developer). This is apparently due to Swing bug 5095398. Right - this one is a nasty one.